← MTAP Reviewer PDF Downloads will be available soon! Below is the 2018 Grade 5 Math challenge questions. ____________ 1 What is the value of the largest digit in 5 804 263? ____________ 2 Fill in the blank: 5.361 = 5 + 0.3 + _____ + 0.001. ____________ 3 The tens digit of a three-digit number is one less than its ones digit. If the number is a palindrome (reads the same forward and backward), what is the smallest number that satisfies such condition? ____________ 4 Calculate 4 × 80 + 5(23 − 7). ____________ 5 Round the product of 1563 × 28 to the nearest hundred. ____________ 6 Which is bigger, or ? ____________ 7 What is the product of 2.47 and 1.9? ____________ 8 What is the greatest number which rounds to 50 400 when round to the nearest hundred? ____________ 9 If no digit is repeated, what is the difference between the largest and smallest whole numbers that can be formed using the digits 1, 3, 4, 6, 7? ____________ 10 What digit can be put in the blank so that the resulting number is divisible by 4: 10 6_____6? ____________ 11 List in increasing order the three lowest odd ϐive-digit numbers formed using all of the digits 0, 1, 3, 5, 6. ____________ 12 What is the greatest common factor of 108, 162, and 180? ____________ 13 If the GCF of 18 and 6795 is 9, what is their LCM? ____________ 14 The tens digit of a two-digit number is 2 more than its ones digit. If the number is divided by 10, the remainder is 6. What is the number? ____________ 15 If 123.4 × 6.017 = 742.4978, what is the value of 12.34 × 6017? ____________ 16 What number is halfway between 1.9 and 1.91? ____________ 18 Find three decimals on the number line between 3.2 and 3.3 so that the give decimals are equally spaced. ____________ 19 A five-digit number is divisible by 9. A new number is formed by interchanging the hundreds and ones digits. What is the remainder when this new number is divided by 9? ____________ 20 Four-sevenths of the class bring lunch to school. Twelve students do not bring their lunch to school. How many students are in the class? ____________ 24 Given a proper fraction, what will produce a bigger number: multiplying both numerator and denominator by 2, or adding 2 to both numerator and denominator? ____________ 25 Write down all common multiples of 9 and 12 which are less than 100. ____________ 26 Round 6% of Php 56.85 to the nearest centavo. ____________ 27 The number 138 is 60% of what number? ___________ 30 How many pieces of ribbon m long can be cut from a piece of ribbon 8 m long? ____________ 31 A movie lasting 2 hours and 43 minutes ended at 1:25 PM. At what time did the movie start? ____________ 32 A classroom has length 12 m and width 8 m. What is its perimeter in cm? ____________ 33 A blackboard has area 72 sq ft. What is its area in sq yd? ____________ 34 There are 240 Grade 6 students and 320 Grade 5 students in Bagong Pilipinas ElementarySchool. Give the ratio in lowest terms of the number of Grade 6 to Grade 5 students. ____________ 35 The ratio of the number of boys to the number of girls in the class is 7 ∶ 9. If there are 48students in the class, how many more girls are there than boys? fraction of the class are 12 years old boys? ____________ 38 If the square in the grid has area 1 sq cm, what is the area of the shaded polygon? ____________ 39 Kyle’s car uses 5 liters of gasoline per 150 km. How far can Kyle drive on 3.5 liters of gasoline? ____________ 40 The area of a rectangle is 50 sq cm. 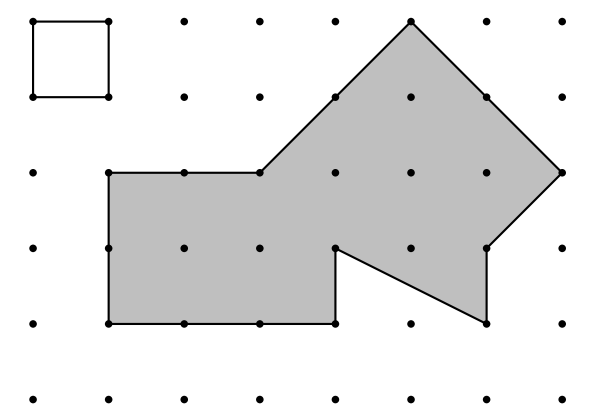 If both length and width are increased by 10%, what is the area of the resulting rectangle? ____________ 41 A t-shirt was marked Php 300.00. Roland bought it at 20% discount and sold it at 15% profit. How much did he sell the t-shirt for? ____________ 42 A ball bounces of the distance it has fallen. If a ball is dropped from a height of 18 ft, how high will it go on the third bounce? ____________ 43 The average of 30, 42, 𝑁, 50 is 38. What is the value of 𝑁? ____________ 44 August 12, 2018 can be written as 8-12-18. If the hyphens are ignored, it reads the same forward and backward. We call August 12, 2018 a palindromic date. How many palindromic dates are there in 2018? ____________ 46 How many two-digit numbers are divisible by 3? ____________ 47 What is the sum of all proper fractions with denominators less than 6? ____________ 48 Carlo was born in January. This year, Carlo’s age is the same as the date of his birthday. If Carlo’s age is divisible by 5 and the sum of the digits (more than one digit) of his age is aprime number, how old could Carlo be? ____________ 50 A number 𝑁 is divisible by 10 but not by 25. If 𝑁 has three digits and has only two prime factors, what is the highest possible value of 𝑁? This entry was posted in Grade 5-6 and tagged grade 5 math challenge, grade 5 math challenge reviewers, grade 5 mtap questions, grade 5 mtap reviewer. Bookmark the permalink.